The Top Five video games subscription services made $273m in revenue between July and September 2018. That's according to new research from SuperData which says that the top three services generated six per cent of total premium PC and console revenue for that period. The company claims that subscribers pay 45 per cent more for games 'upfront' than non-subscribers. Meanwhile, this audience spends twice the amount than non-subscribers. PlayStation Now is, perhaps unsurprisingly, the dominant service by some margin, generate 52 per cent of venue. This is likely due to the sheer install base of the PlayStation 4, which stands at over 86m units sold since its November 2013 launch. 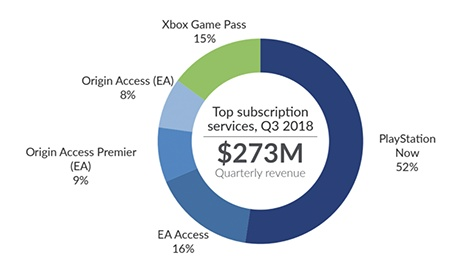 Second place - by some way - is EA Access on Xbox One with a 16 per cent slice of the pie, while Xbox Game Pass claims 15 per cent of the sector's cash. Meanwhile, EA's newly-launched Origin Access Premier has a nine per cent stake, ahead of regular Origin Access which claims eight per cent. That does mean that EA is behind 32 per cent of total subscription service revenue, almost a third of the sector. The firm will no doubt be happy seeing its new Premier service - which sees games launching on the platform day-and-date with their retail release - has picked up traction before any major releases have come to it. Battlefield V and Anthem are arguably the first major excuses to pick up a subscription. EA's offering in this area is only set to grow with the firm revealing new cloud platform Project Atlas. Xbox Game Pass will no doubt grow its market share as the scheme rolls out fully to Windows 10 users. The PC games market is currently lacking a dominant subscription model and if anyone is going to dominate this sector it's likely going to be Microsoft - especially with its rapidly-growing line-up of studios that'll give consumers a great many reasons to subscribe. Much like EA, Microsoft is also investing in cloud tech which will no doubt play into the subscription model at some point. The Big M's scheme is called Project xCloud. Though the subscription model clearly works for the video games space, it certainly raises questions over how we judge the success of individual games. For example, Microsoft has announced positive launches for Sea of Thieves, State of Decay 2 and Forza Horizon 4 with some impressive early player figures, but these titles are part of its Xbox Game Pass and Play Anywhere schemes, making it less obvious how many people have actually splashed the cash on these titles. In addition, player figures don't mean a huge amount when someone could have logged in to Rare's pirate romp once and never gone back. “The game subscription market heated up immensely in 2018 as game makers sought sources of consistent, recurring revenue,” principal analyst Carter Rogers said.